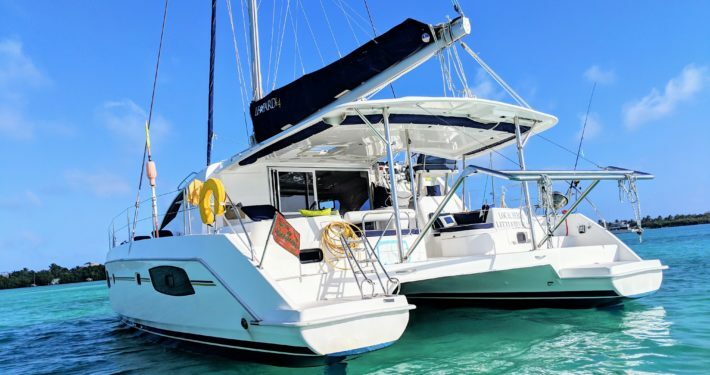 Your customized Belize vacation package includes captain, chef, excellent gourmet cuisine, standard open bar (rum cocktails, beer and wine with dinner), cabins with private bathroom/shower, equipment for snorkeling, kayaking, fishing and much more. 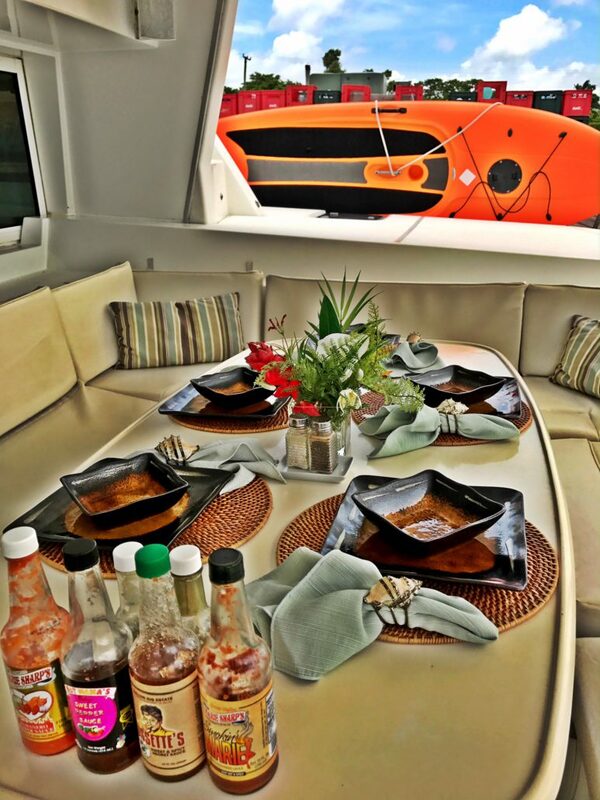 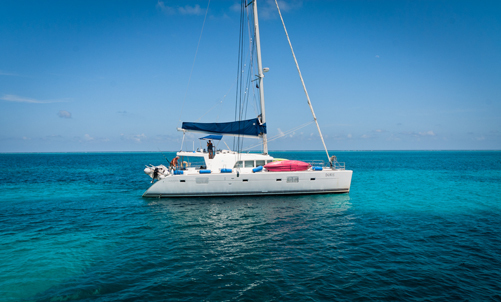 Included is land transportation upon arrival from the Belize International Airport to Cucumber Beach Marina. 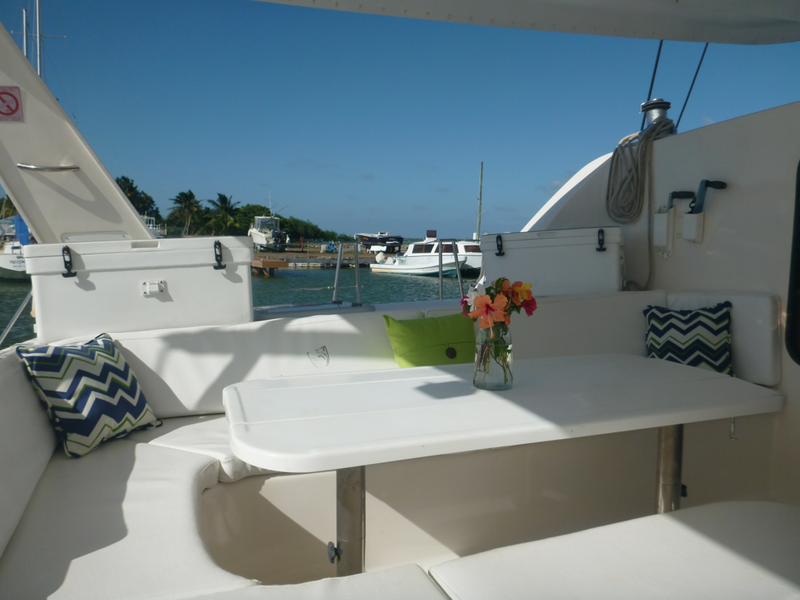 Gratuity is not included in the charter price. 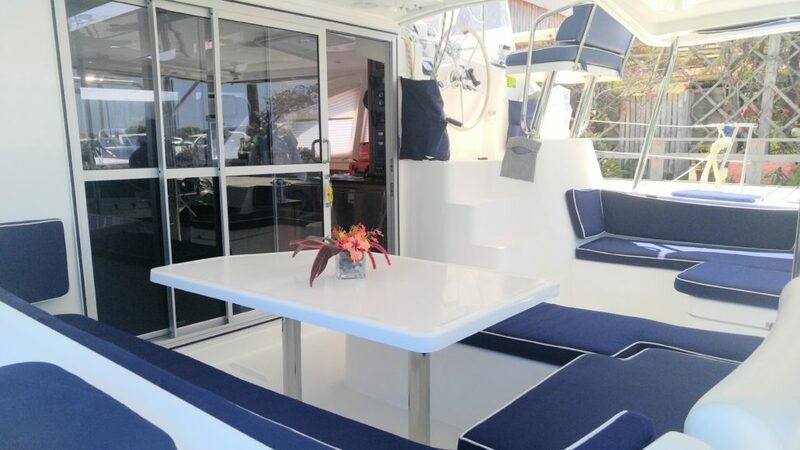 Yacht Charter Check In & Departure Time: Noon. 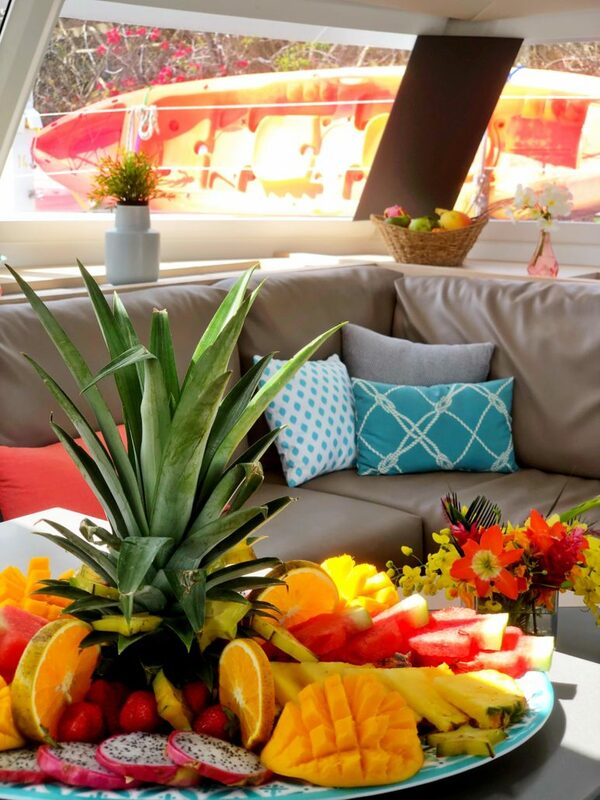 Concierge Services available for wedding planning. 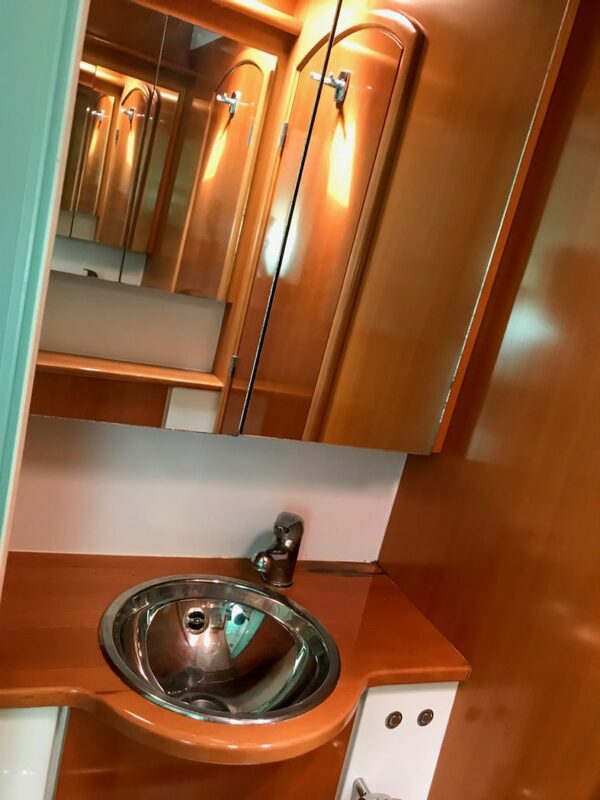 Peak week pricing may apply. 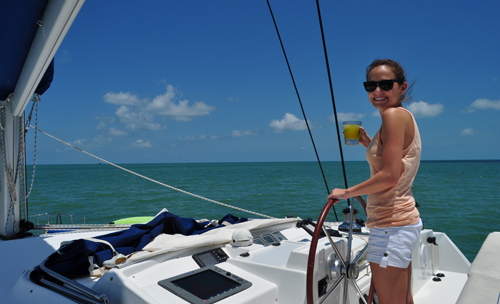 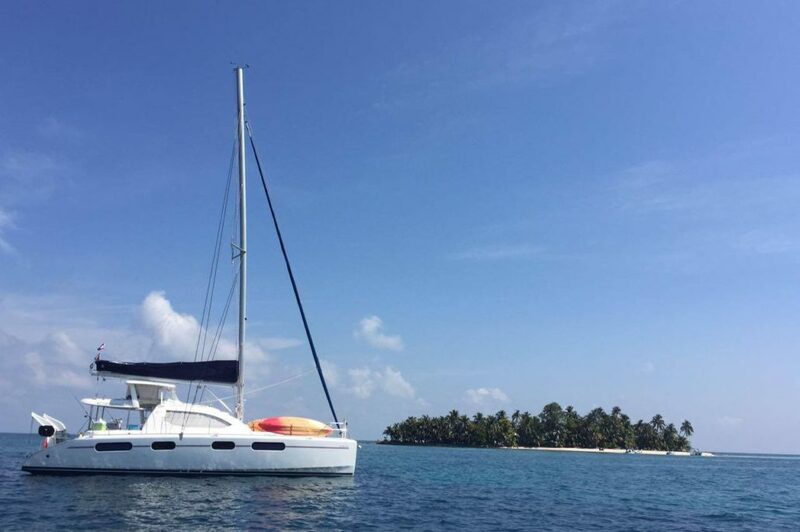 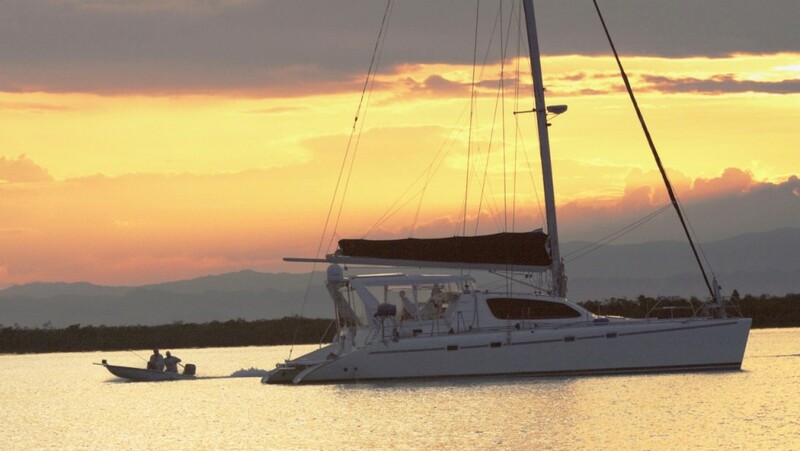 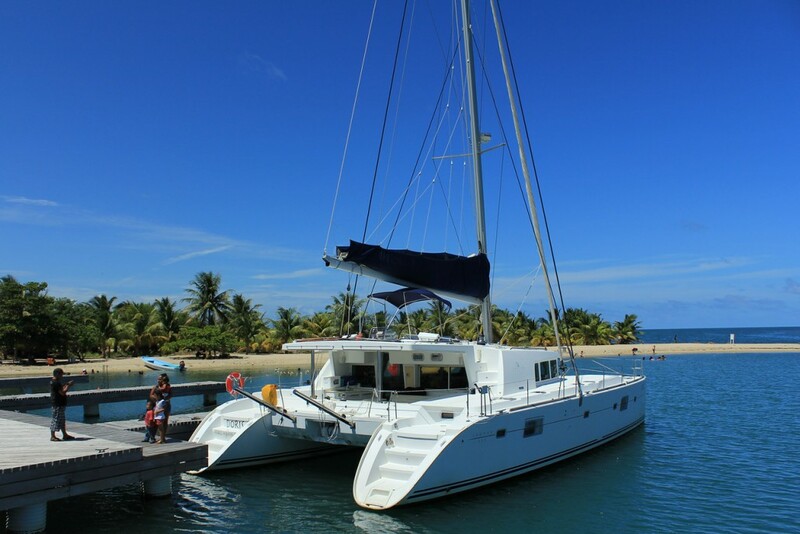 A 2014 Leopard, Flojo has all the features for a comfortable and elegant sailing vacation in Belize! 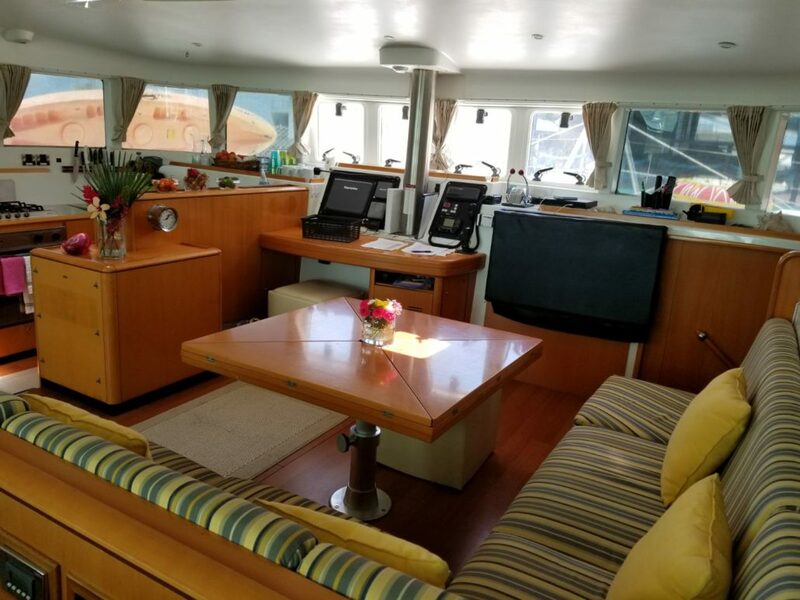 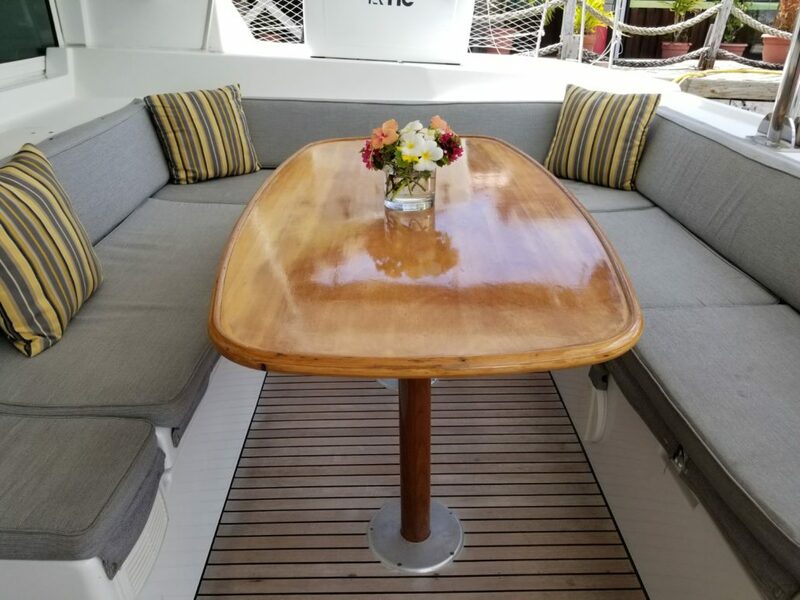 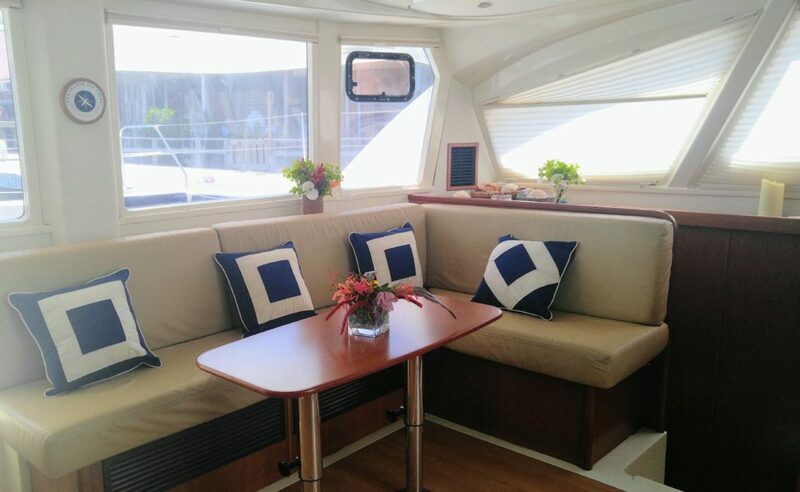 Her bonus feature “cocktail lounge” on the foredeck adds another lounging space, perfect for relaxing in the shade as you are underway, or for shady appetisers and sundowners as the sun sets. 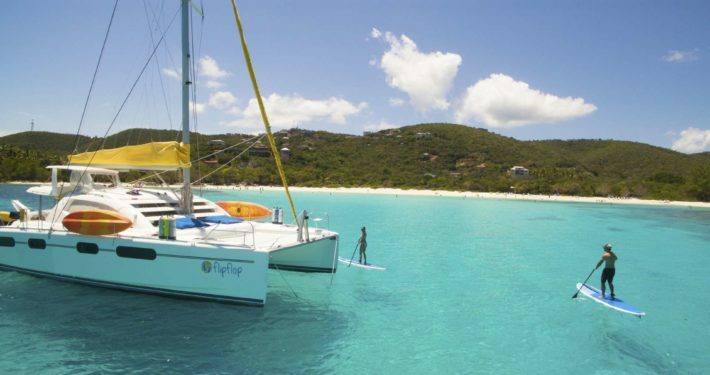 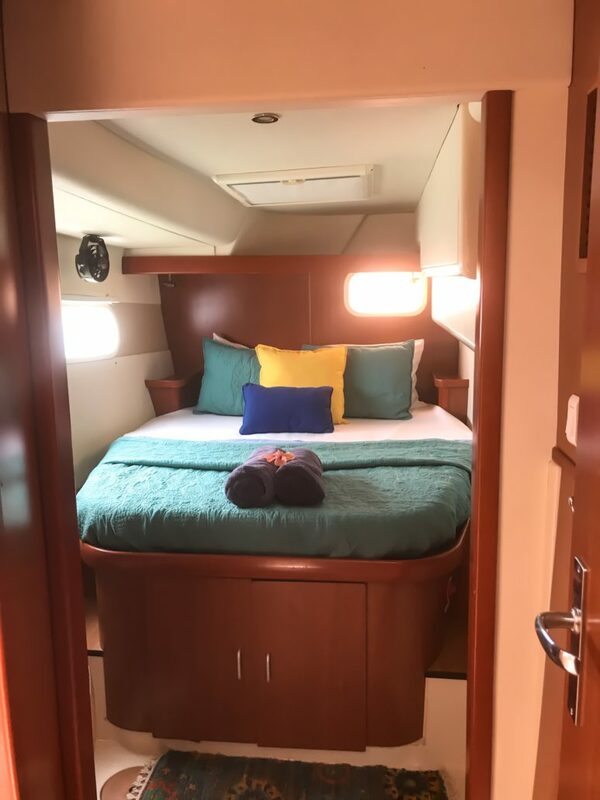 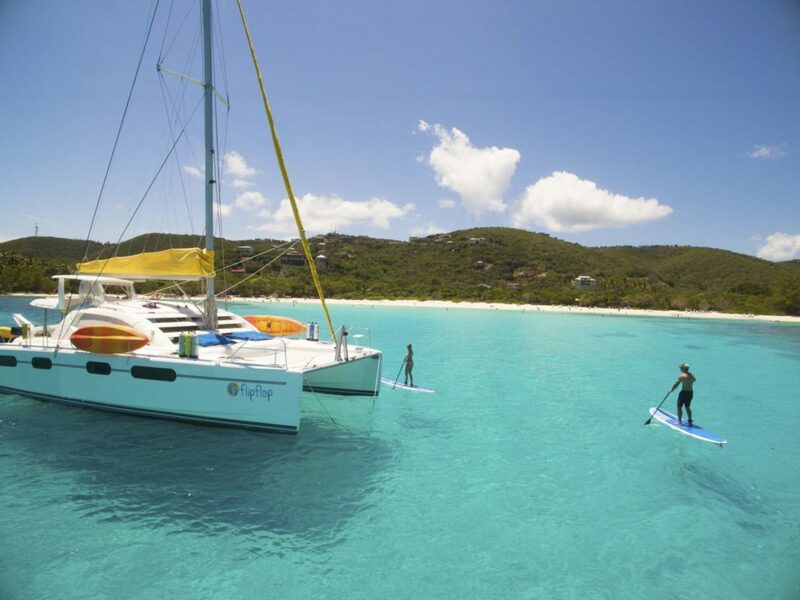 Flojo has 4 air conditioned cabins (one allocated for crew), expansive dining and lounging areas, state of the art entertainment systems and the full complement of BSV ‘toys’, including kayaks, floaties, fishing gear, snorkel gear and a stand up paddle board. 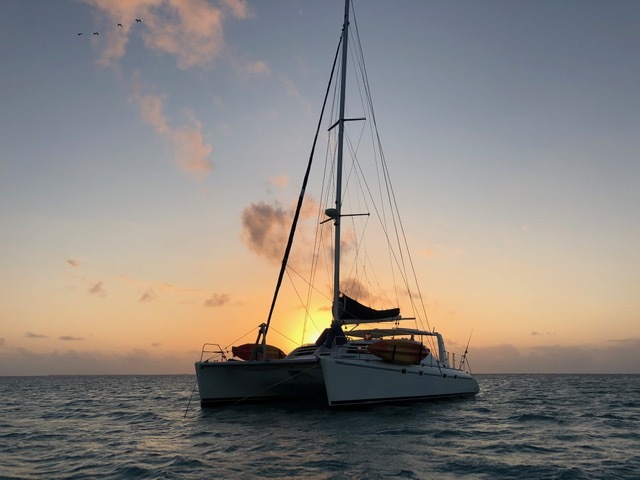 Please note that for peak season bookings (Christmas and New Year’s Eve weeks) rates will incur a 10% surcharge and are based on 6 person charters with a minimum stay of 7 nights. 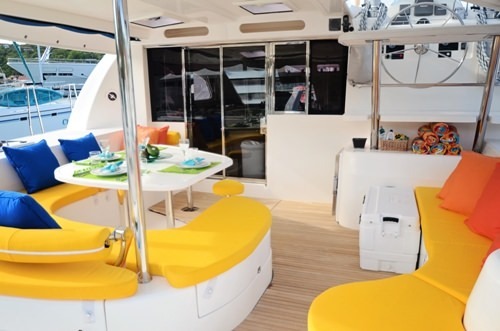 Luna Sea is the true party boat due to her expansive integrated outdoor dining, lounging and cockpit space, made even more fun with a lowering swim bench, perfect for ‘sit and dip’ sundowners! 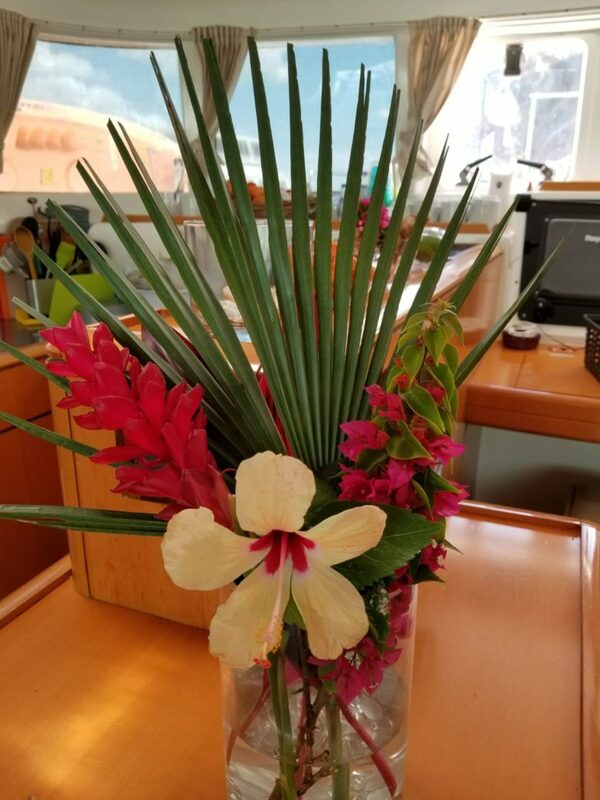 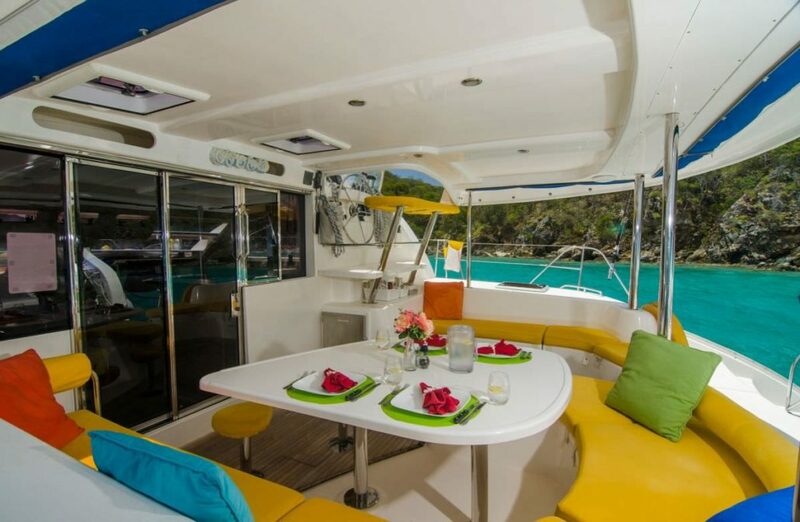 Luna Sea also has bright and colourful island interiors that sets the tone for your tropical all inclusive vacation from the moment you step on board. 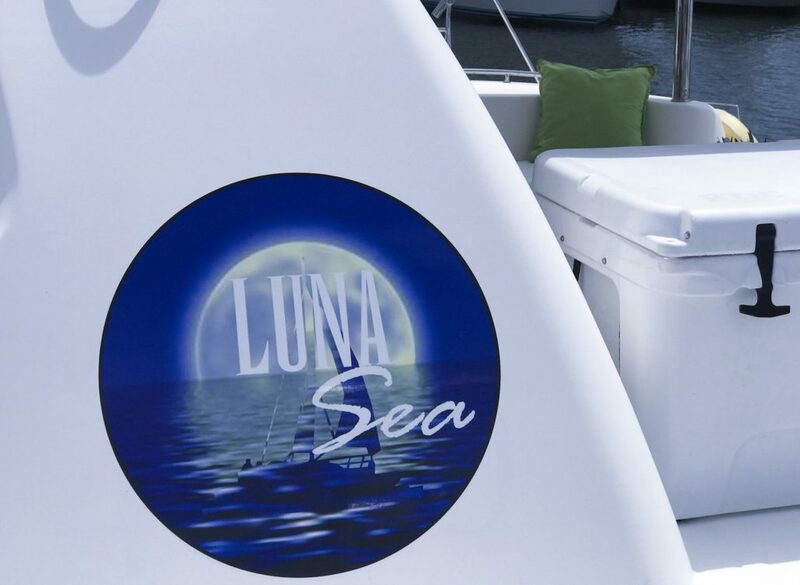 Luna Sea has 3 queen cabins available for guests, all with private bathrooms and air conditioning. 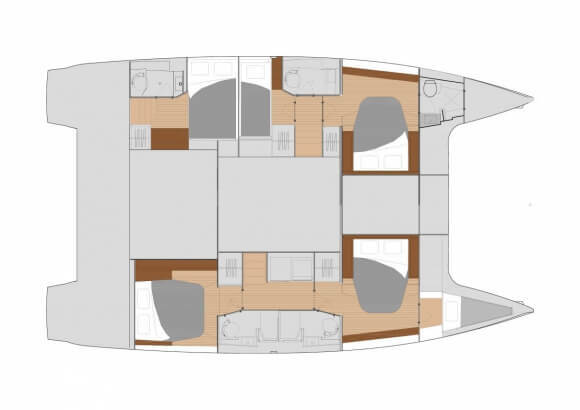 The 4th cabin is allocated to crew. 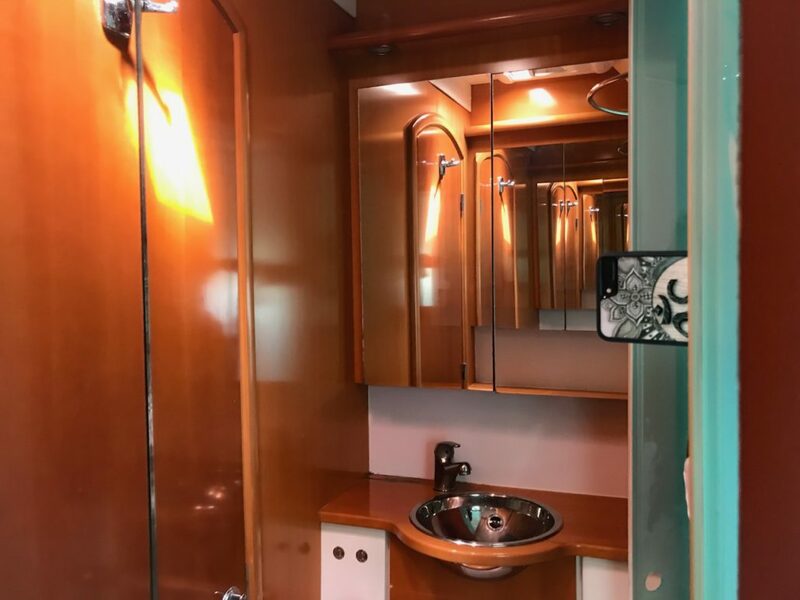 The three cabins can sleep up to six adults. 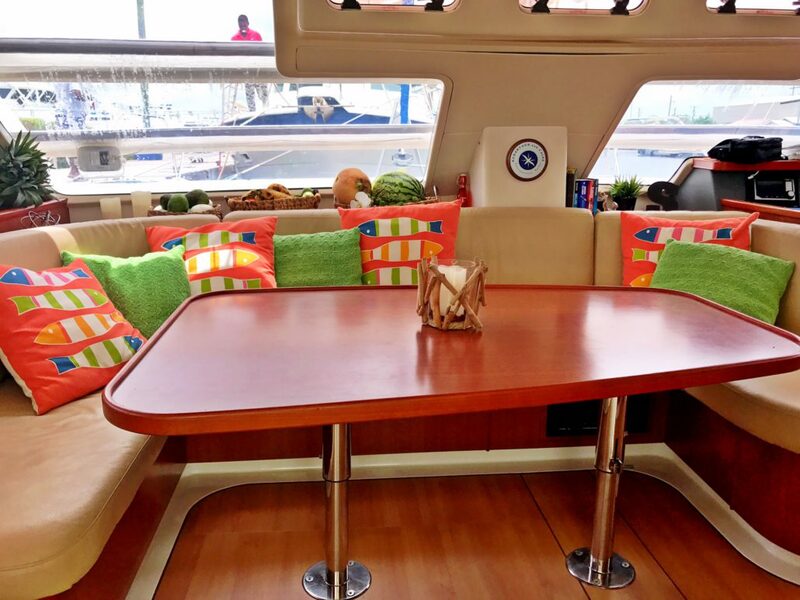 Furthermore, the indoor salon dining area converts to a lounger bed, perfect for those with kids wanting additional sleeping space. 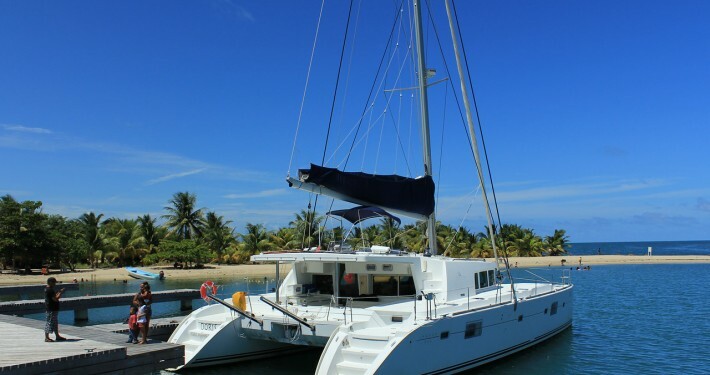 Please note that for peak season bookings (Christmas and New Year’s Eve weeks) rates incur a 10% surcharge and are based on 6 person charters with a minimum stay of 7 nights. 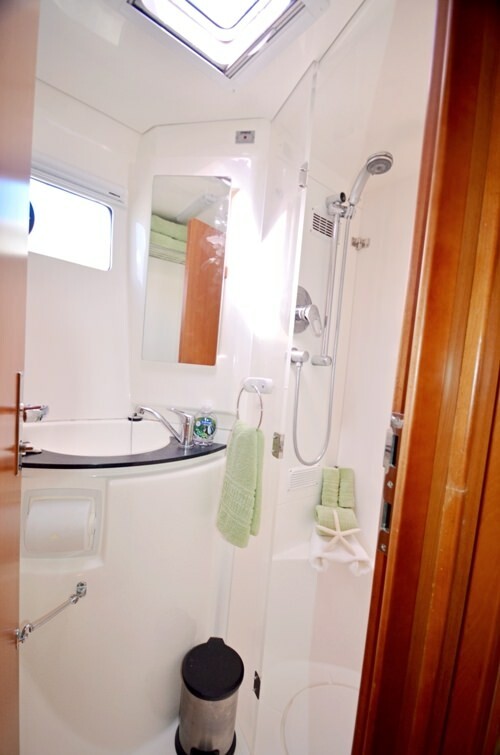 There are 3 queen cabins available for guests, all with private bathrooms and air conditioning. 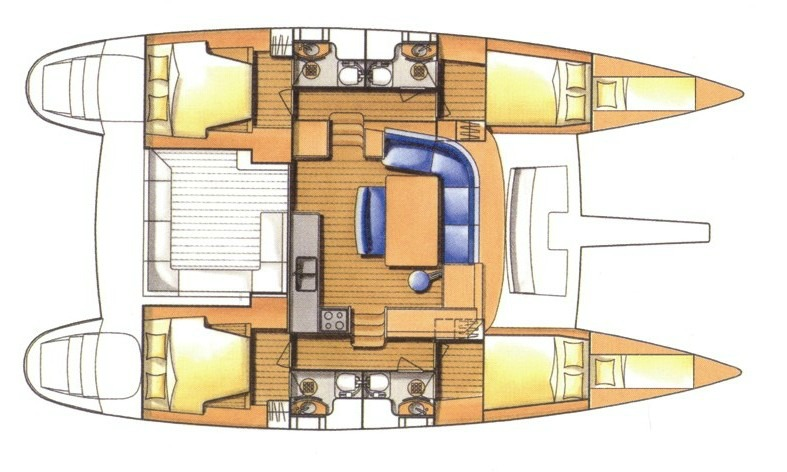 The 4th cabin is allocated to crew. 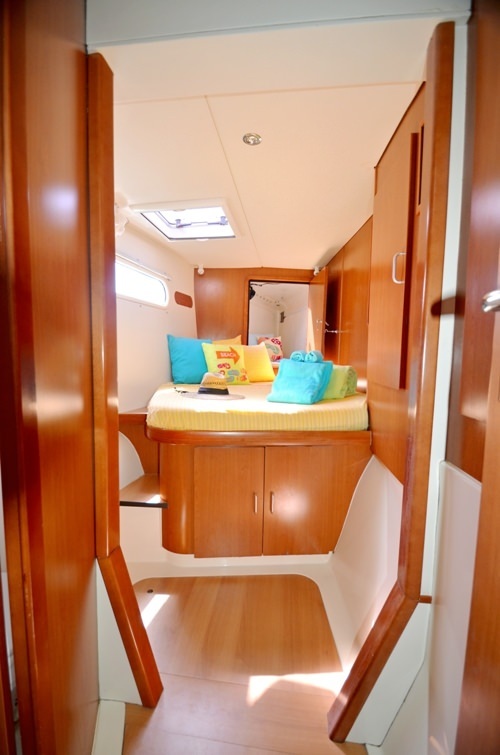 The three cabins can sleep up to six adults. 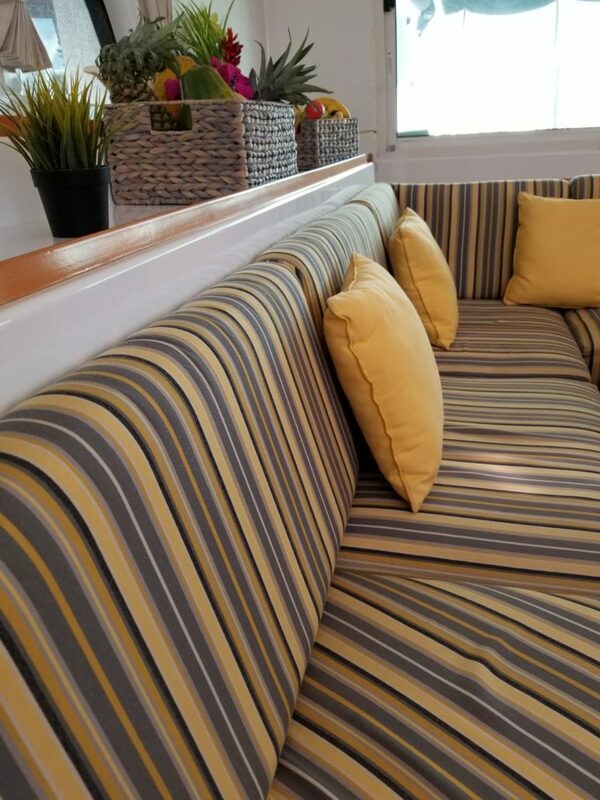 Furthermore, the indoor salon dining area converts to a lounger bed, perfect for those with kids wanting movie night and popcorn! 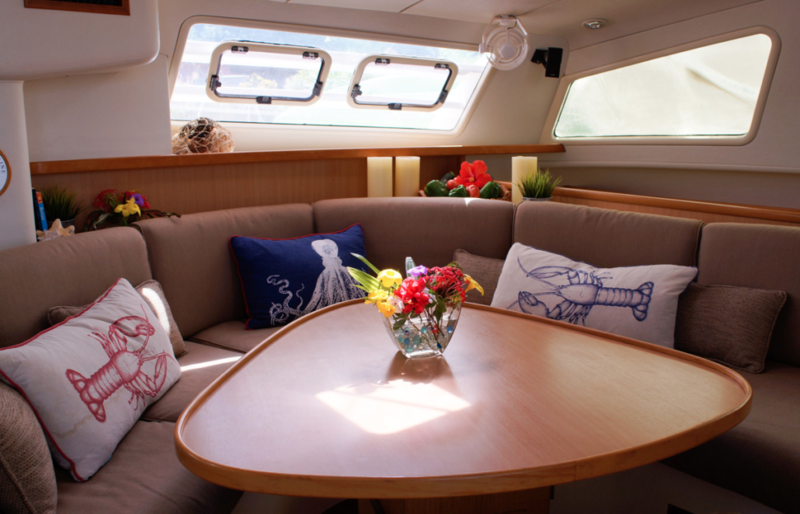 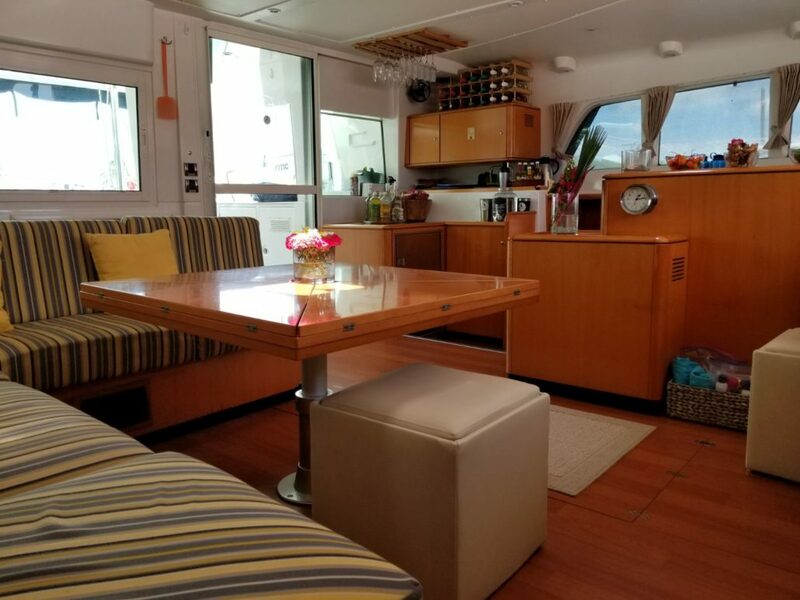 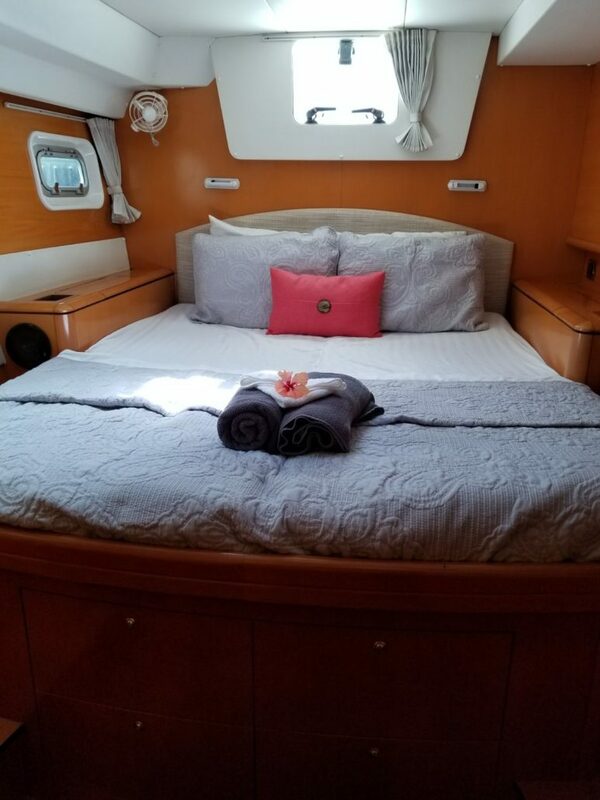 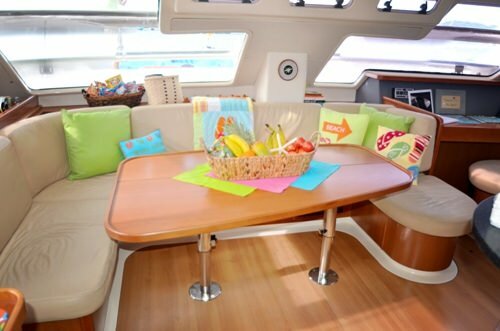 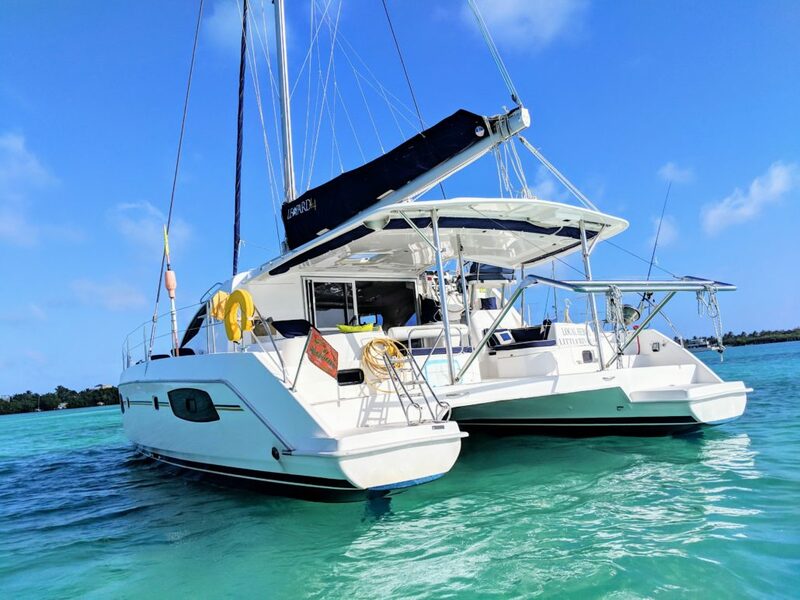 Perfectly formed Island Girl has all the best features for your sailing vacation, including 3 guest cabins, indoor and outdoor dining and lounging areas, forward outdoor couch and all the toys. 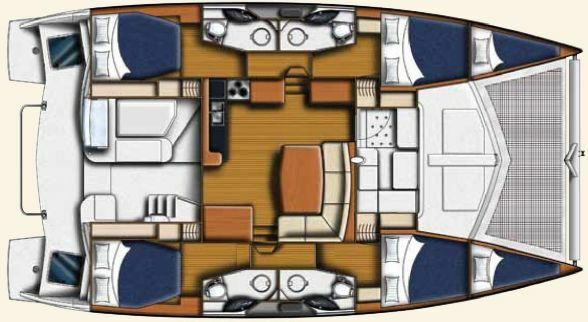 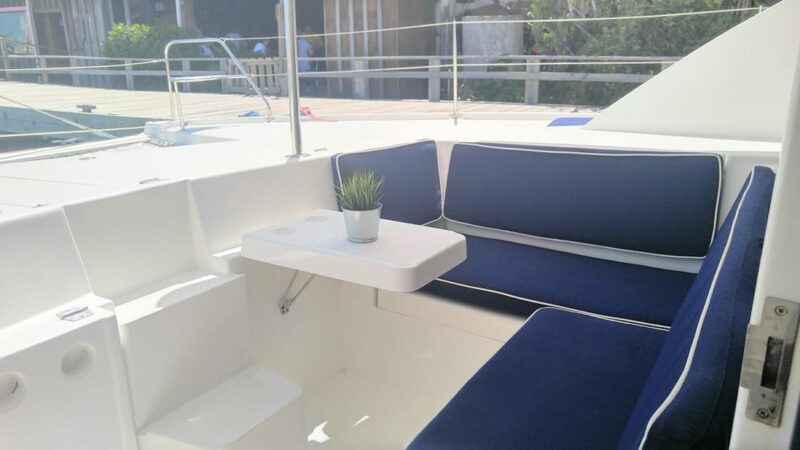 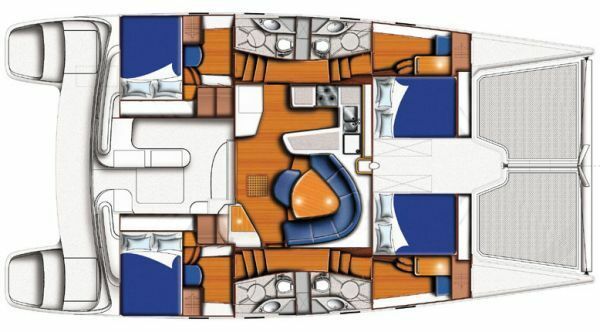 Furthermore, she has a spacious upper flybridge with additional cushioned bench seating for guests to participate in the sailing, sunbathe or just enjoy the breeze and spectacular view. 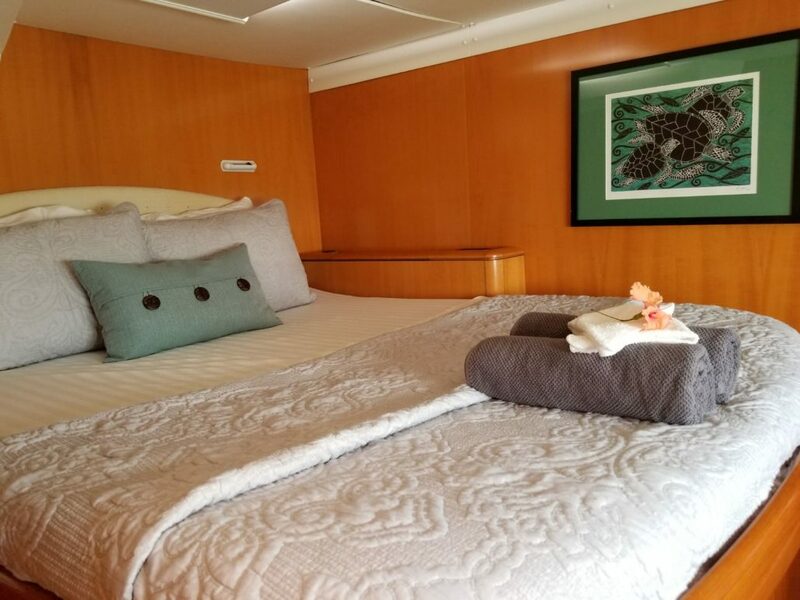 There are 3 queen cabins available for guests, all with private bathrooms and air conditioning. 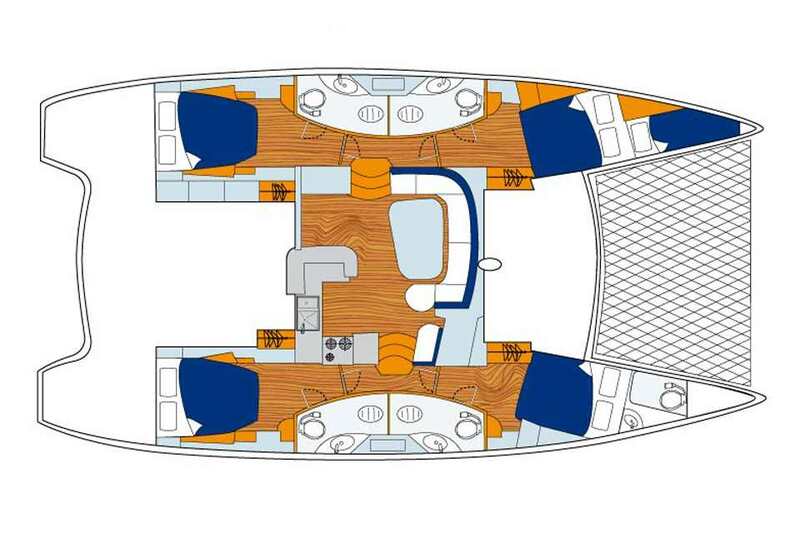 The 4th cabin is allocated to crew. 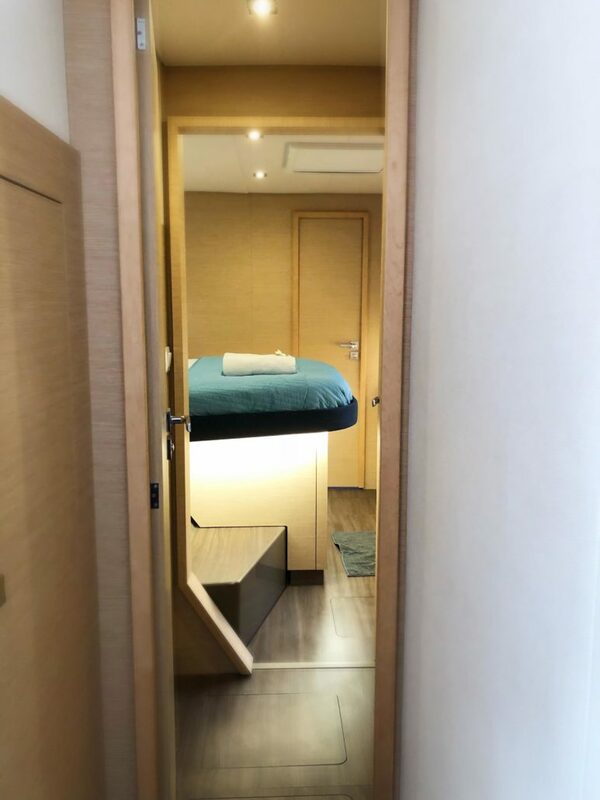 The three cabins can sleep up to six adults. 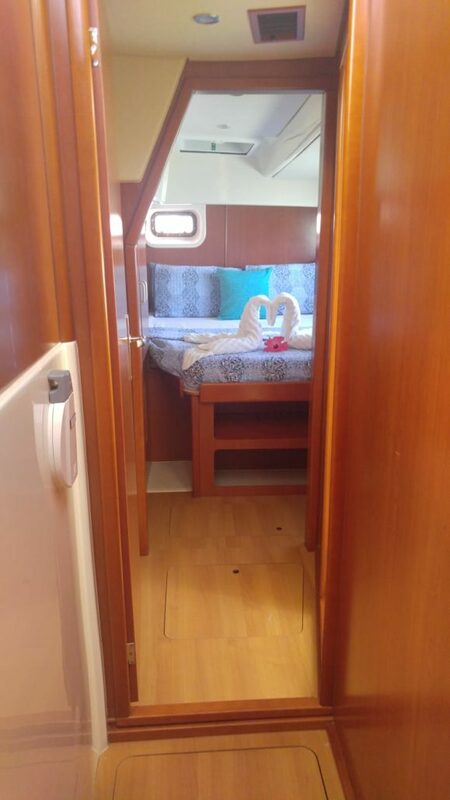 Please note that for peak season bookings (Christmas and New Year weeks) rates incur a 10% surcharge and are based on 6 person charters with a minimum stay of 7 nights. 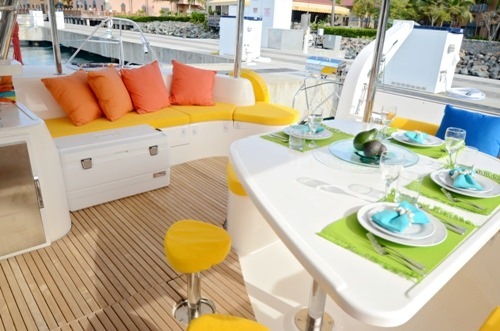 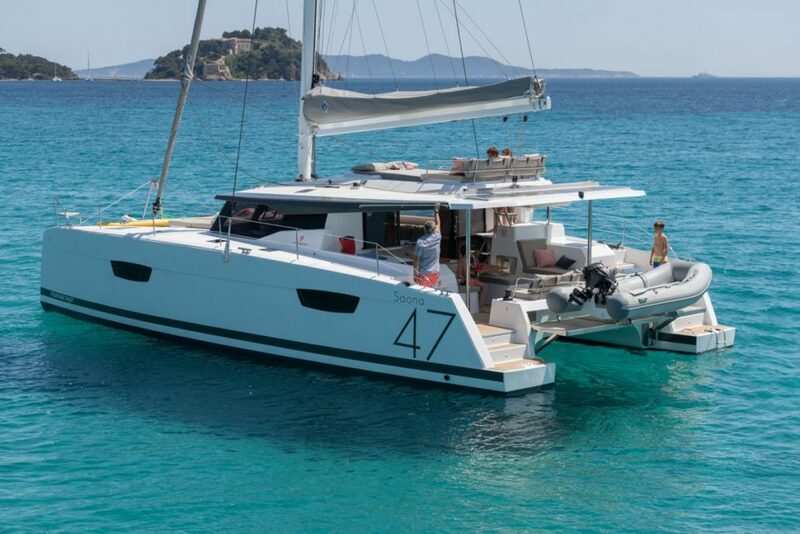 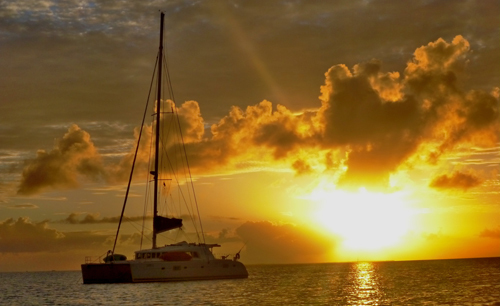 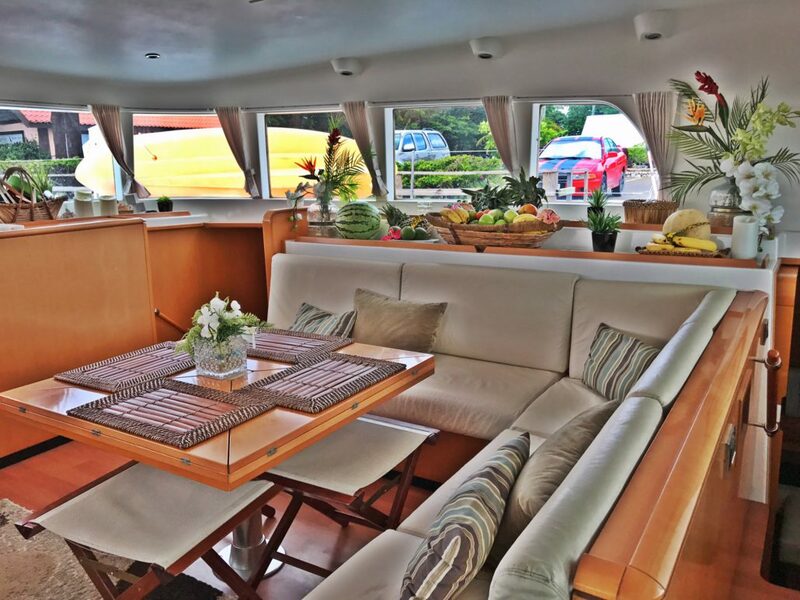 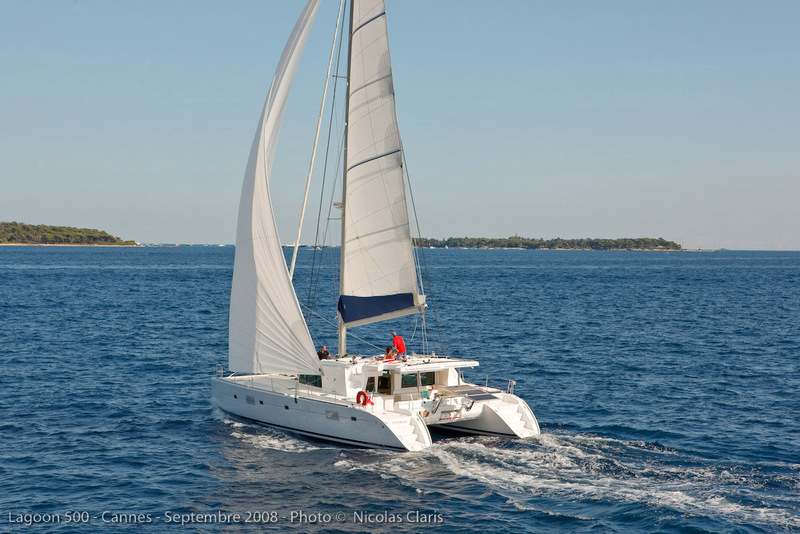 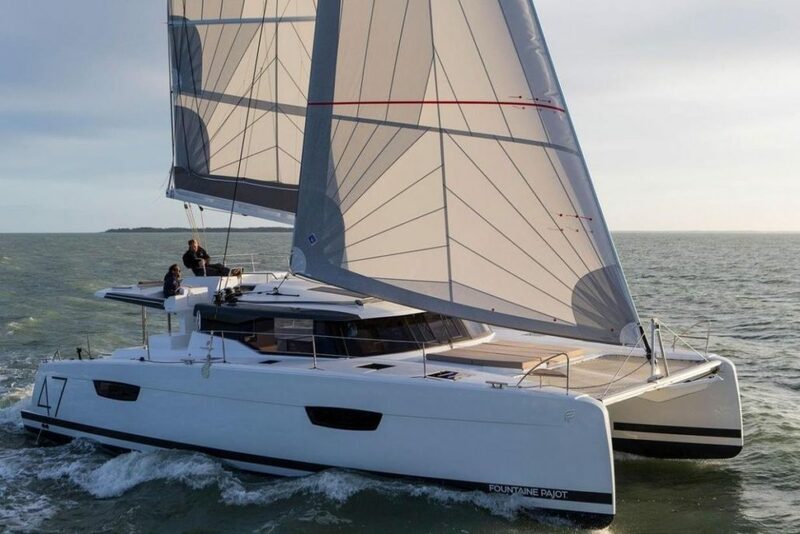 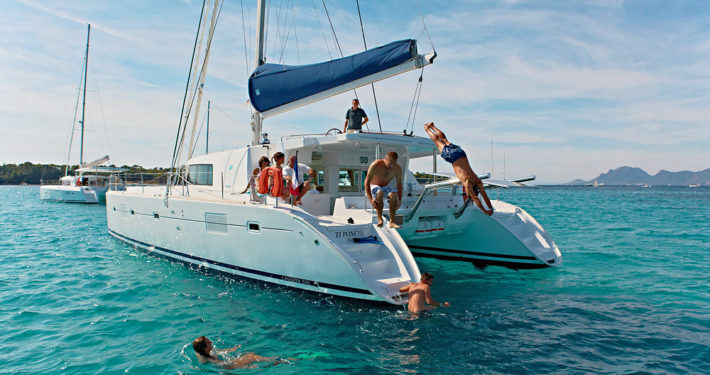 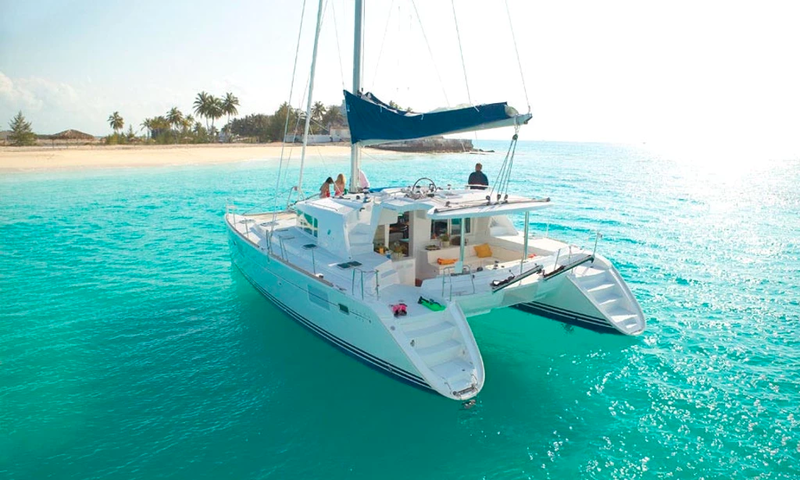 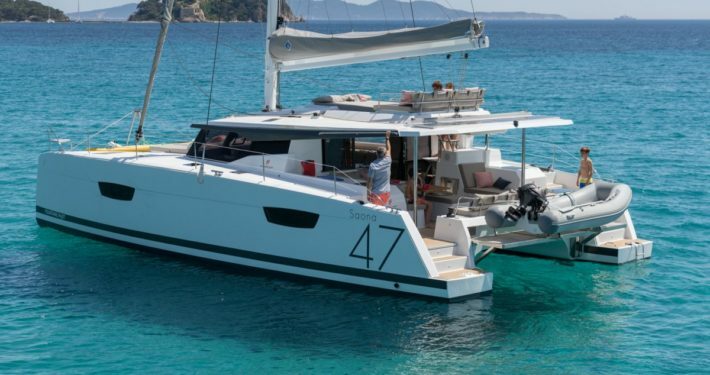 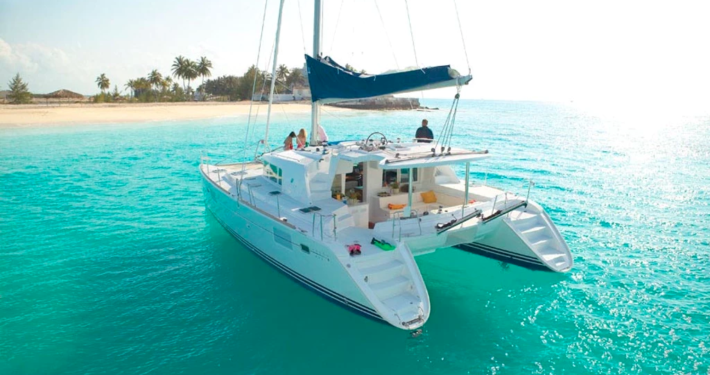 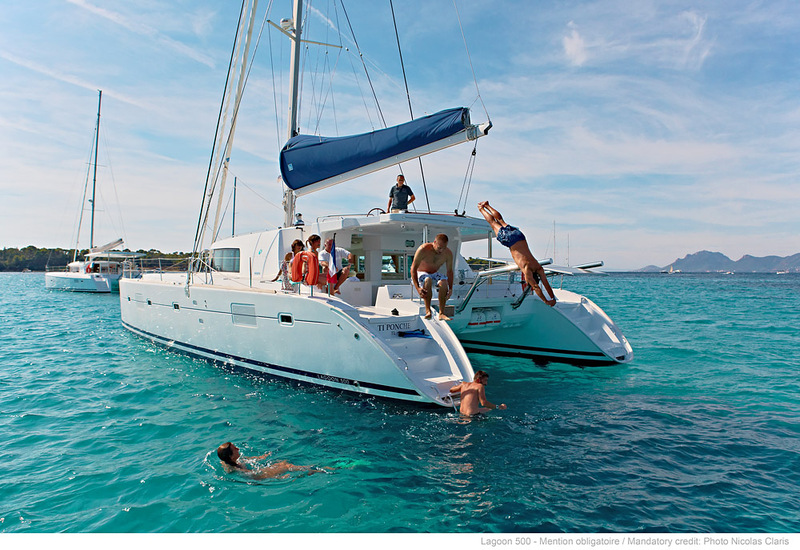 Experience the ultimate in sailing luxury aboard Doris, a sleek Lagoon 500 Catamaran. 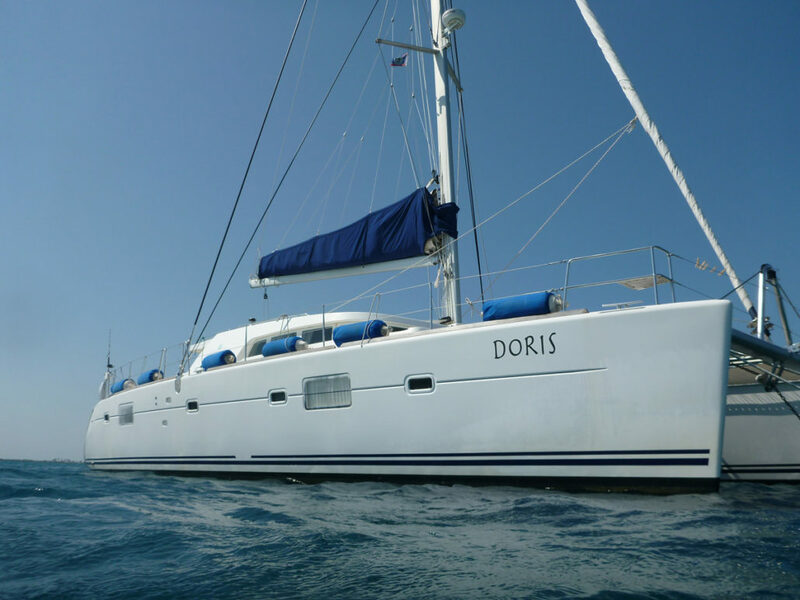 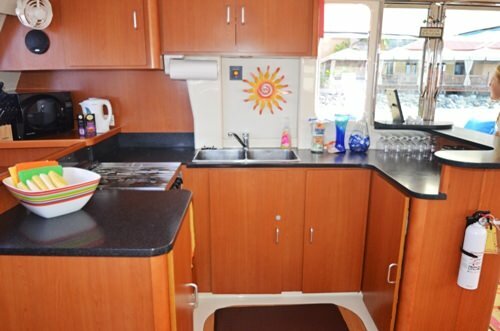 Equipped with all the toys, Doris boasts 4 luxurious air-conditioned cabins, private bathrooms, TV, a state of the art entertainment system throughout and expansive indoor and outdoor dining and lounging areas. 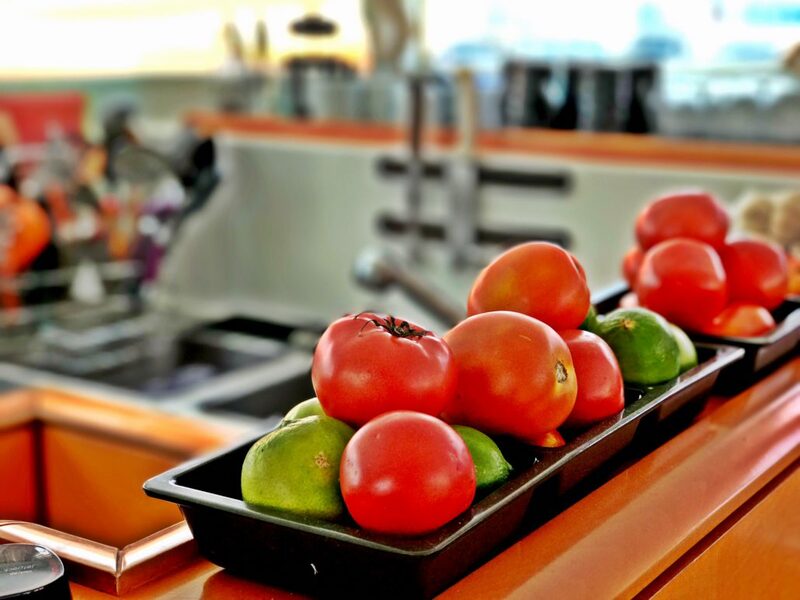 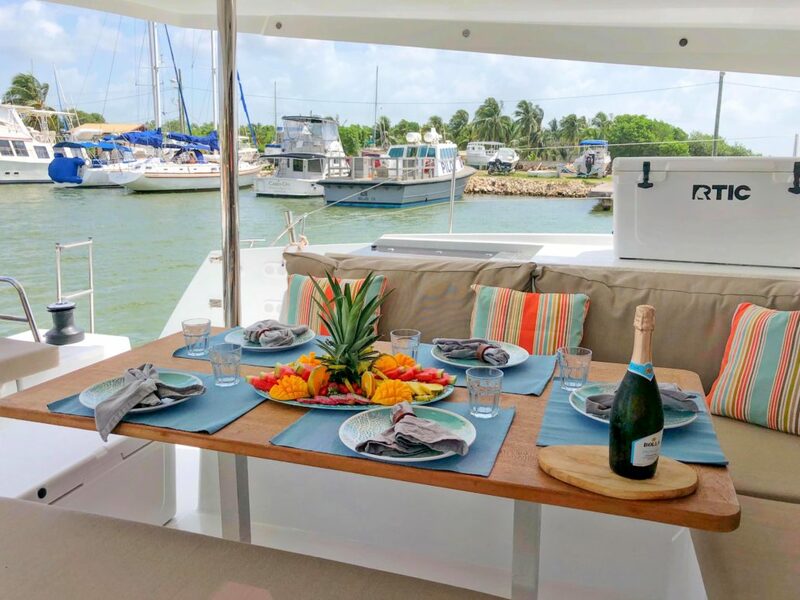 Coupled with fabulous gourmet cuisine, prepared on board by your personal chef, you can be assured of the ultimate in comfort and style whilst cruising the azure waters of the Belize coastline. 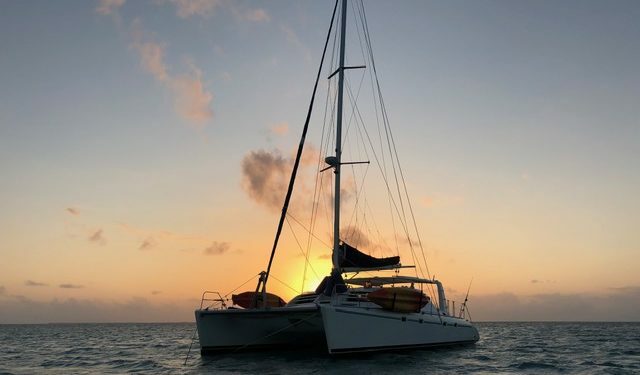 Mary (formerly ‘Flip Flop’) is a Robertson & Caine Leopard 46 catamaran who joins BSV for the 2018 / 2019 season. 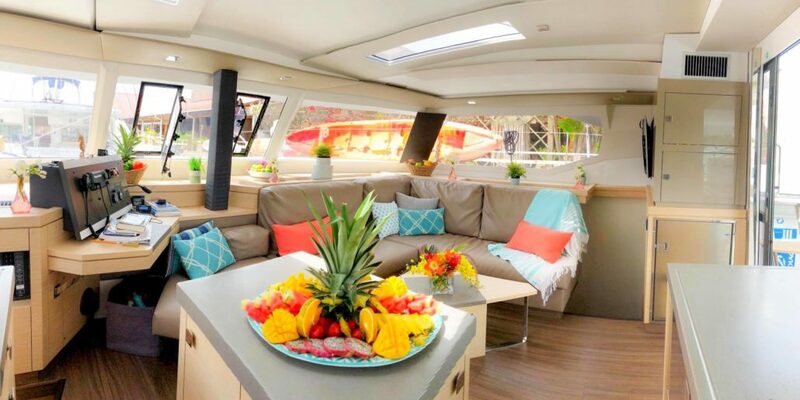 She offers guests three double en-suite cabins (4th cabin allocated to crew) and is packed with water toys including floats, boards and water sports toys and her Caribbean-themed colors scream Vacation! 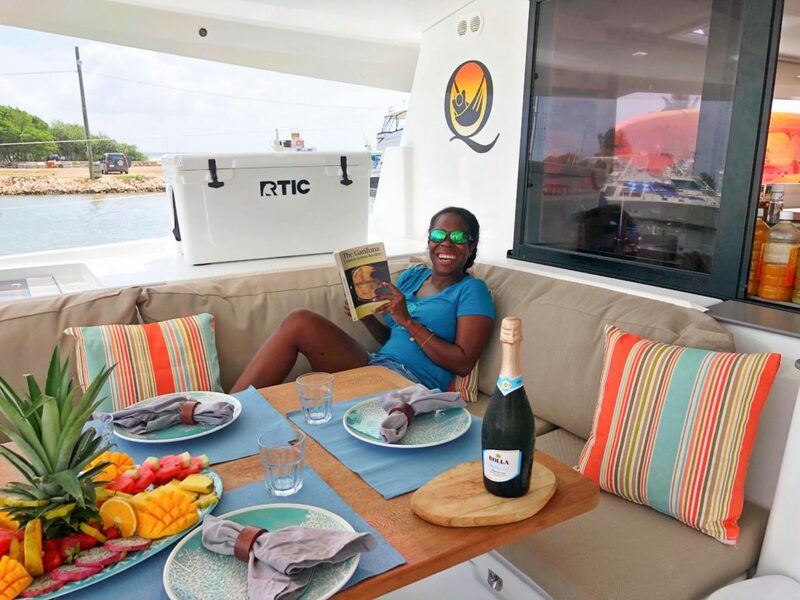 Join Mary’s crew for a great mix of activity and leisure, gourmet dining and unique itineraries, perfectly customized to fit your group’s preferences. 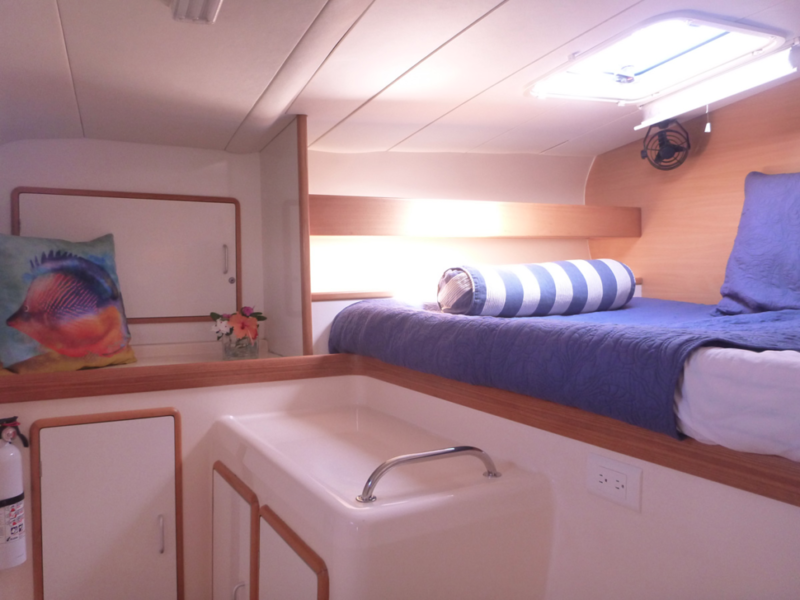 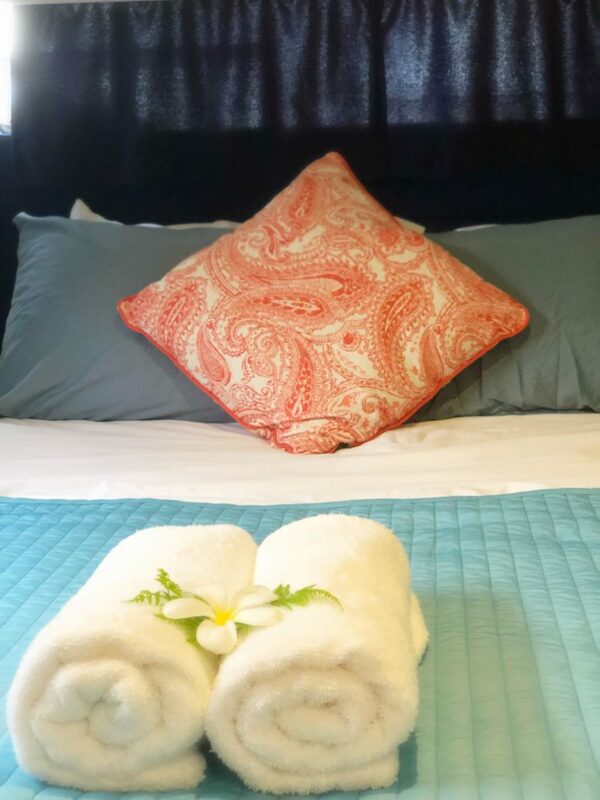 Mary has 3 queen cabins available for guests, all with private bathrooms and air conditioning. 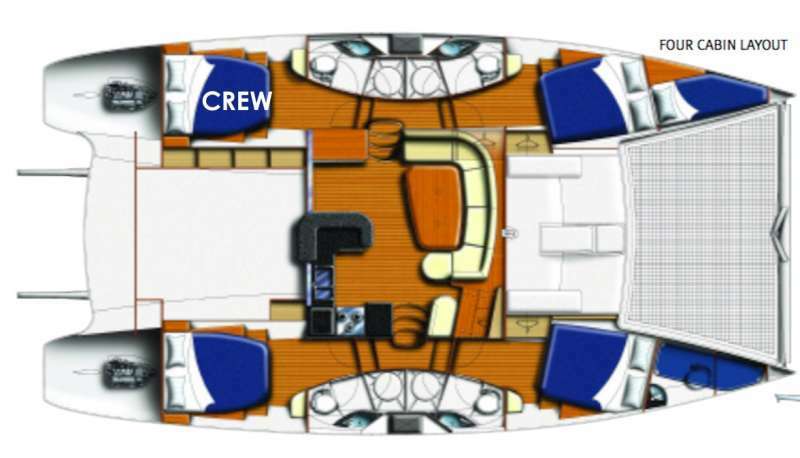 The 4th cabin is allocated to crew. 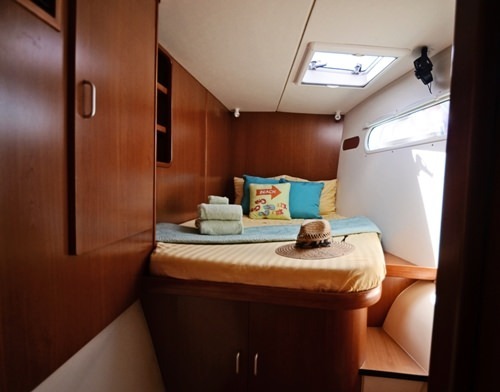 The three cabins can sleep up to six adults. 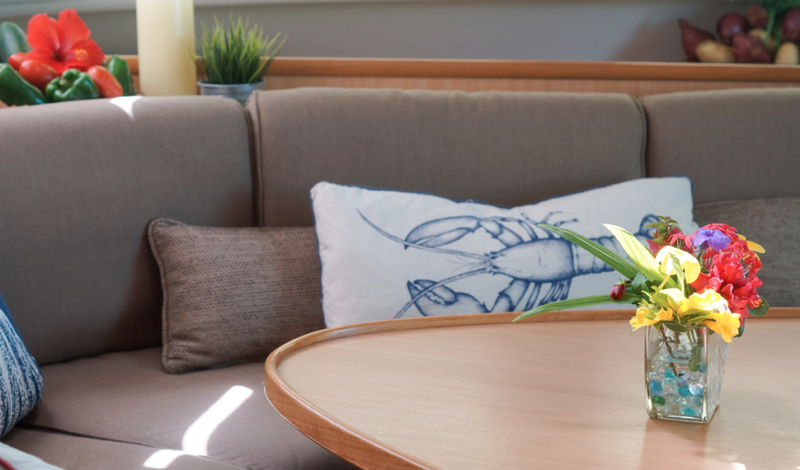 Furthermore, the indoor salon dining area converts to a lounger bed, perfect for those with kids wanting additional sleeping space. 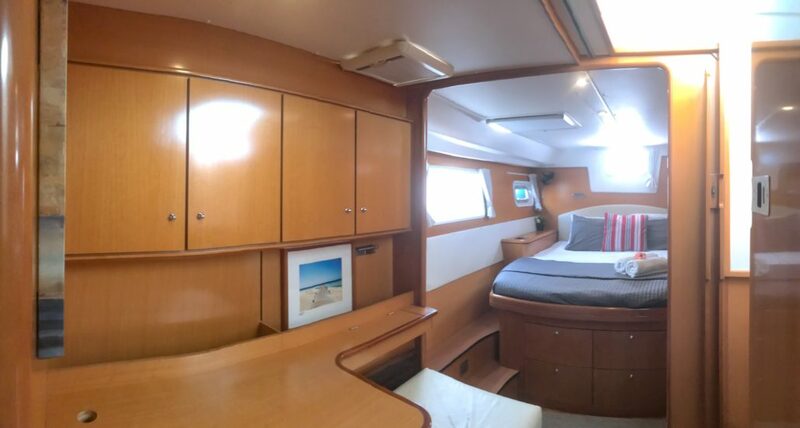 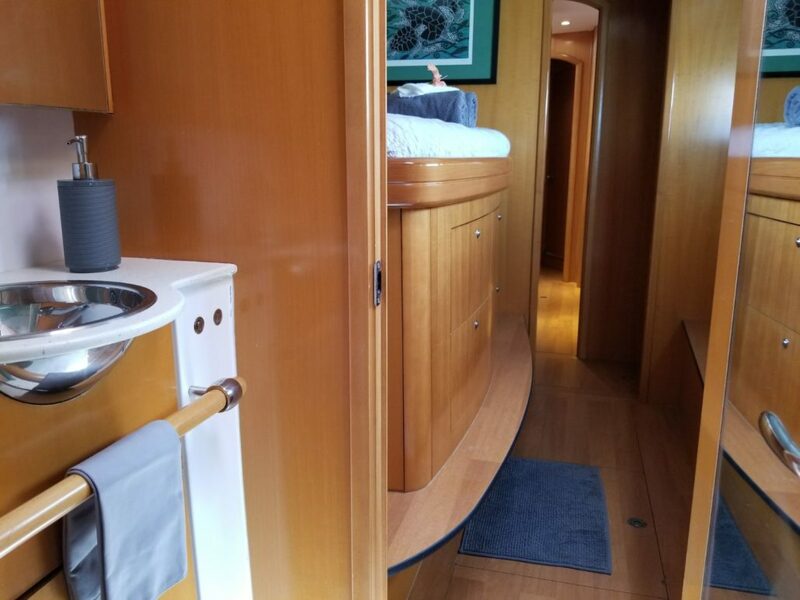 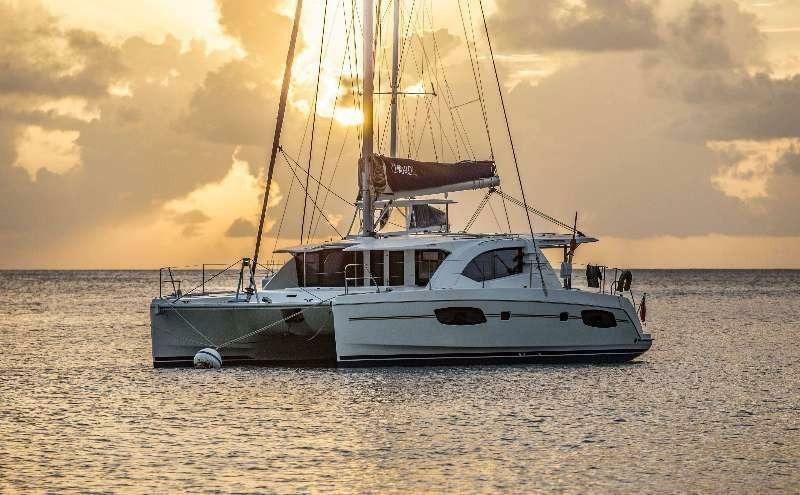 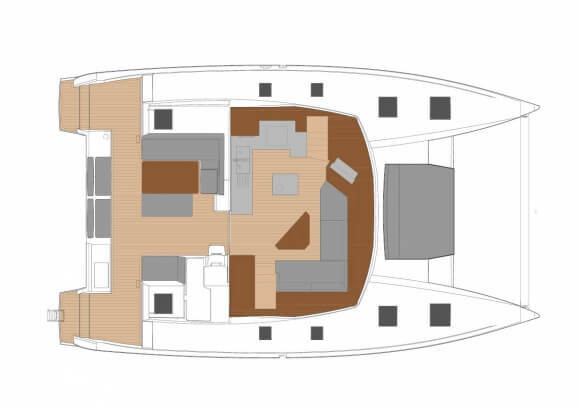 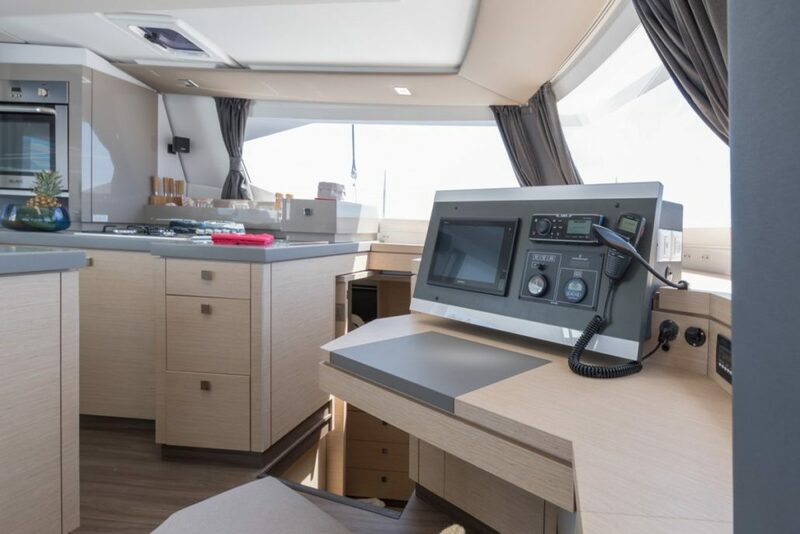 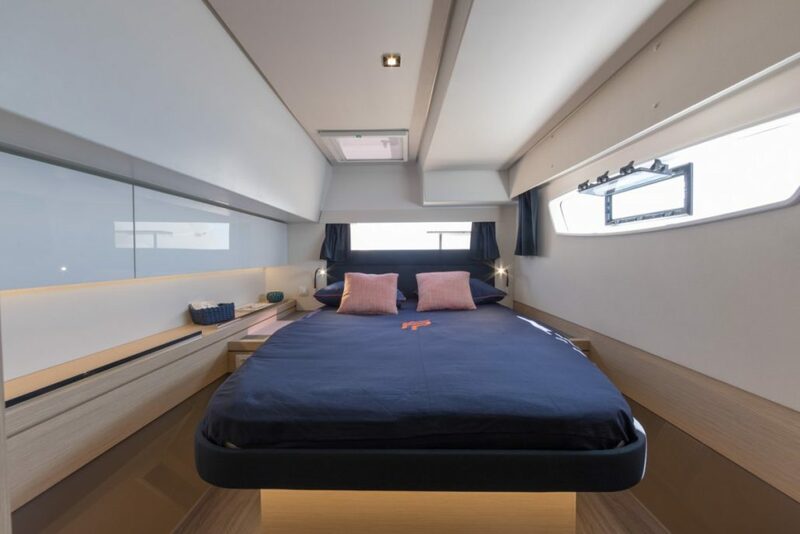 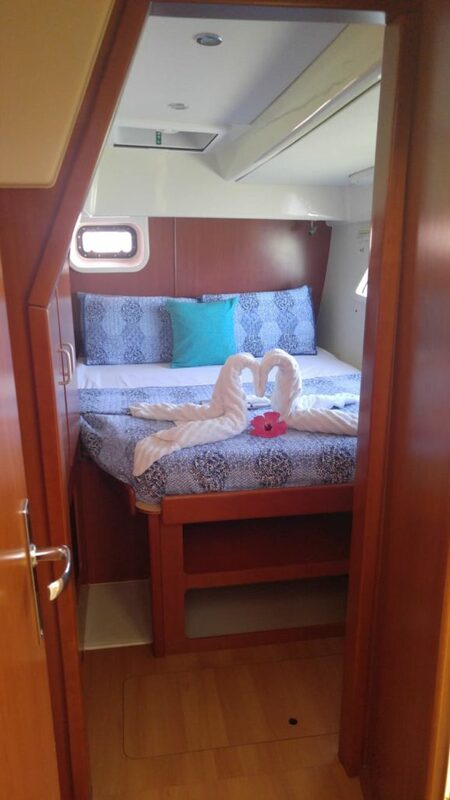 Your elegant home from home ‘Nera’ is a perfect yacht for groups of friends or larger families, as she has an additional 5th bunk bed cabin to accommodate 8 guests. 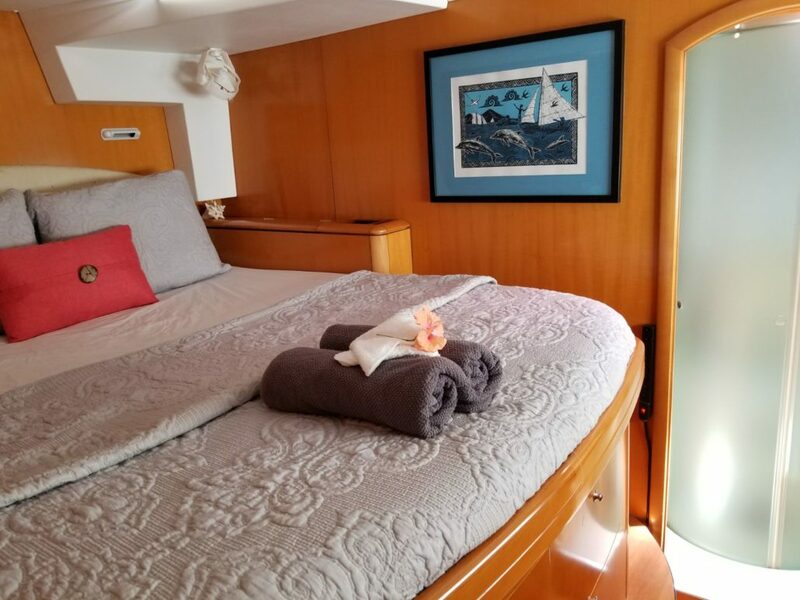 With multiple owner upgrades and decorative finishes, you can be assured of optimum comfort and style while sailing the Azul Belize waters. 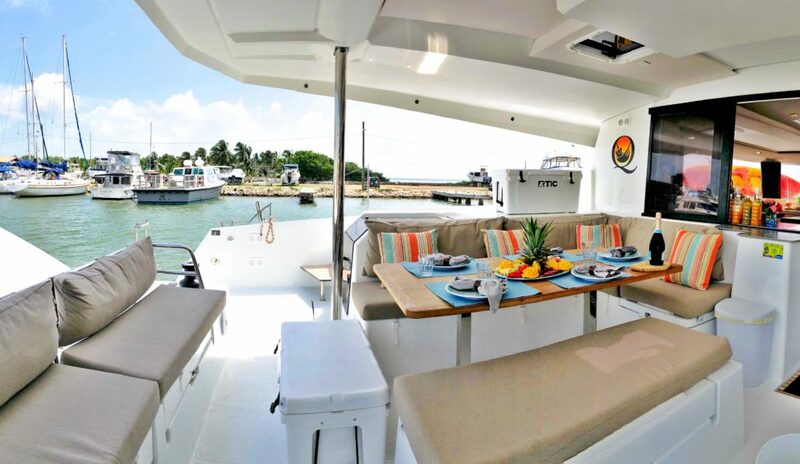 Nera features 4 queen cabins and one bunk bed cabin, air conditioning, private bathrooms, TV, a state of the art entertainment system throughout and expansive indoor and outdoor dining and lounging areas. 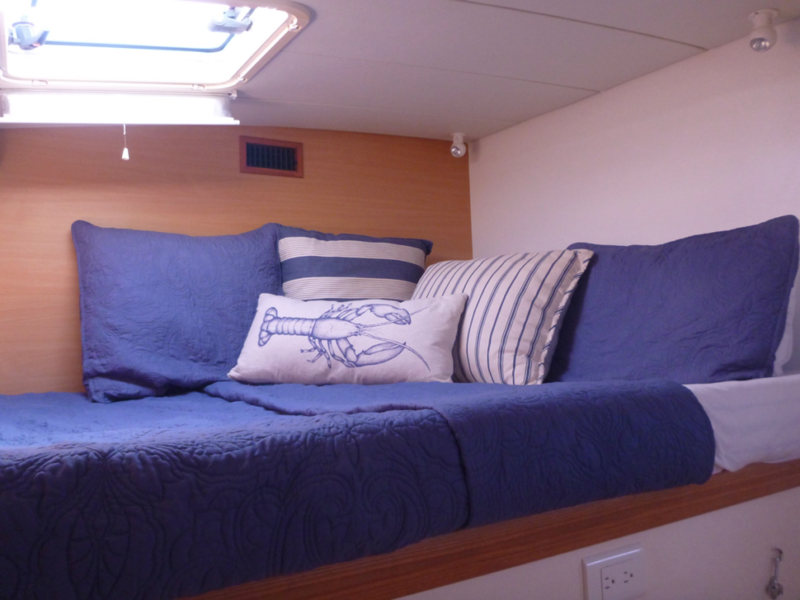 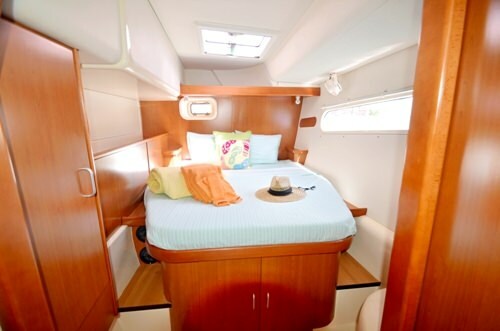 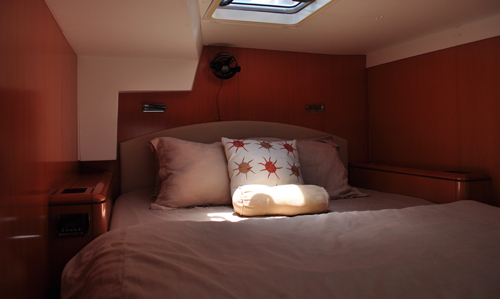 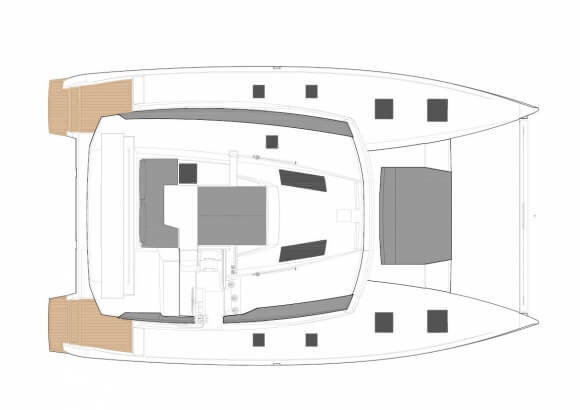 Further benefits include a large Bimini hard top for extra shade and comfort. 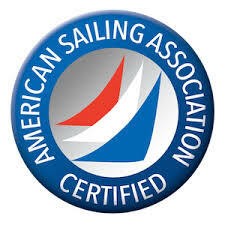 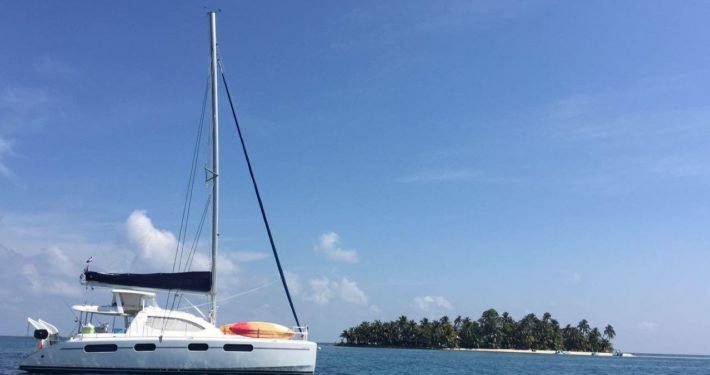 We are proud to be an American Sailing Association (ASA) affiliated sailing school, specializing in sailing instruction delivered in a Belize catamaran live-aboard charter environment. 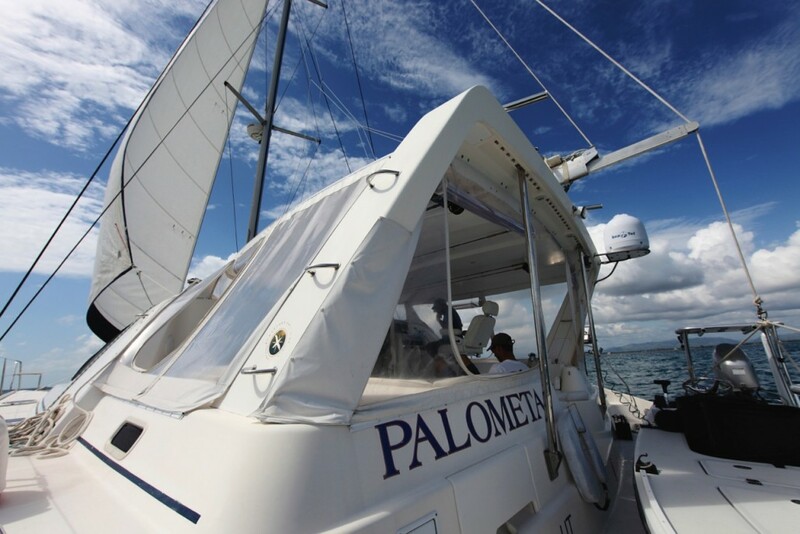 Learn more about the full range of sailing instruction services available.